“Adventures in Design” is taking an adventure. This month I will have an alter ego called Mimi. Mimi is a perfectionist and is obsessed with watercolor paints, only three colors of watercolor paints—the primary ones—of course. Red, yellow, and blue. The primary colors make up all colors on the color wheel and Mimi likes to be efficient— why bother with anything that is not needed. Mimi has decided that she will paint at least three times a week for the month of April. Hereby known as “International Fake Journal Month” or IFJM. 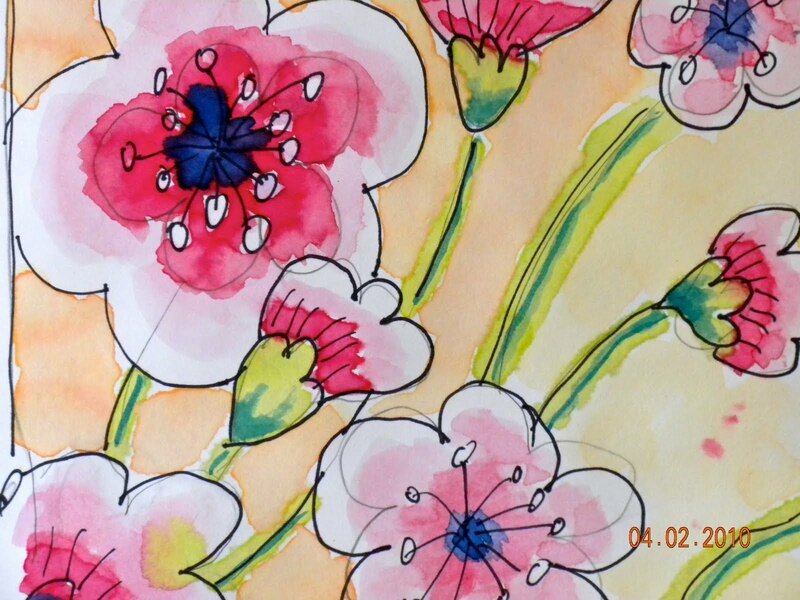 In this journal she will study primary colors with watercolor paints, focusing on color harmony and focal point. Mimi likes to make a point. Only perfection, only necessities. Mimi says things like, “of course” and “I knew that” or “practice makes perfect.” She really thinks she knows it all. Don’t let her know that “practice makes progress”—not perfect. Follow along with Mimi this month. Please note: International Fake Journal Month idea came from officialinternationalfakejournalblog.blogspot.com/ Check it out by clicking the dog button on the left side of my (Mimi’s) blog. This entry was posted in Art, business, design, flowers. art, Garden, graphic design, International Fake Journal, kids, logo, mother, painting, pass it on, teaching, Uncategorized, watercolor, woman. Bookmark the permalink. I love it! The flow, the strokes and the colors are great! Mimi sounds like someone I can definitely understand. I too get lost in the "perfection". Thanks for posting. Can't wait to see what else Mimi does. Fizz is so different huh?